I’m jumping in the last wagon of the year. One of the final words is Books. And what a book for me. The first time I read it, I didn’t like it a lot. But after some years being a student I discovered this book anew and read it again. Ever since that day, it’s one of my favorite stories. I’m jumping in the last wagon and want to tell you about the kindest and most inspirational book of my childhood. A book that I think most of you have already read. A book translated into 300 languages and dialects and is selling nearly two million copies annually. AFOL, chemist in maternity leave, mom of 2. Last months word was Books. Maëlick took us into the world of photography, while Julien took us into a completely different world, or should I say a galaxy, far away. Now I just came to the conclusion that I actually never shared my book with you. It was a book I read earlier this year. The book was very much in the back of my mind when I wrote the original post. 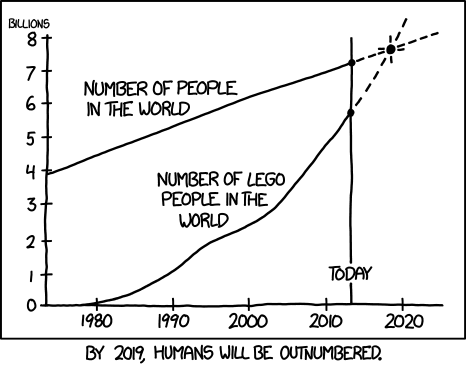 No, it is not a book on the history of little plastic people that will overtake the human race by twenty nineteen as predicted by xkcd as seen below and reported by various media outlets in 2013. If you haven’t guess by now, looking at my social media feed, I love space. Be it the classic spacemen from my childhood or the Star Wars universe, I always dreamt to see our planet from the outside.